"A formula that amazingly still packs a punch"
All Rights Reserved. [/caption] The young boxer continues to work on his craft and eventually finds himself holding the belt of World Heavyweight Champion and making his mark on the boxing world. He decides to celebrate this monumental time in his life by making the next big move for his personal life by proposing to his long-time girlfriend, Bianca (Tessa Thompson) with the blessing of his friend and mentor, Rocky Balboa (Stallone). While the couple comes to terms with their new life together and the prospect of having a child, a part of the fighter’s past comes back into the ring. The boxing promoter, Buddy Marcelle (Russell Hornsby) sees a great opportunity to bring together a matchup that has been over 30 years in the making. As he travels around Russia, he comes into contact with Ivan Drago (Dolph Lundgren) who has been training his son, Viktor (Florian Munteanu) in the brutal world of boxing. Seeing the cathartic and financial pay off for both boxers, Marcelle brings Drago back to the US and challenges the newly anointed champion to the battle of a lifetime. Adonis and Rocky need to come to terms with their past demons and pride to determine if the fight is worth the sacrifice. The storyline all seems familiar and cause many to scratch their heads at the staying power of this franchise, but it simply works. 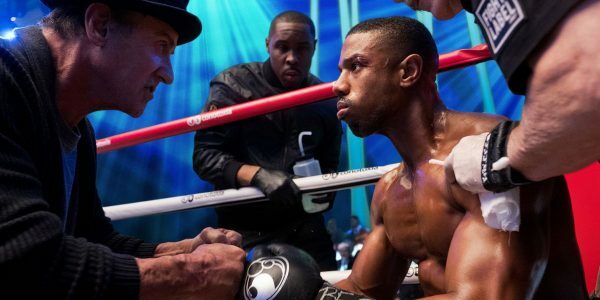 Even though Creed II can be labelled as a boxing film, the longevity can be credited in the loyalty fans feel toward well-written characters and the value of family ties. What this chapter offers is a glimpse into the impact that family has on both sides of the ring, showing that both men have something to prove in the ring and their need to honour the family name. Having these two familial narratives occurring on different, but parallel tracks make the final fight more than a boxing match. Michael B. Jordan continues to make this character volatile, flawed and explosive, but he does not have to carry this franchise on his shoulders. Tessa Thompson and Sylvester Stallone provide the essential depth to his story by providing this central character with the strength to move past his pride and blindspots. Even though director Steven Caple Jr. capitalises on the characters developed by Ryan Coogler, the real compelling elements are found outside the ring with Drago’s family and the challenges the Creed’s experience with the birth of their daughter. This is not a movie that contains any real surprises or breaks new ground in the world of cinema, but what it does have is heart. The characters and the storyline will draw audiences in because fans care about their heroes, flaws and all. Once again, this franchise will make audiences want to run up the stairs in Philadelphia and raise their hands in triumph listening to the Rocky theme song.